As long as it is not in direct sunlight it is accurate. In direct sunlight it does not work well at all. For instance if the temp in 90 degrees it goes up to 120 and stays there. It never budges until mid evening when the temp drops. I know what the temperature is outside, so I can dress accordingly. Only problem I have is that the outside temperature is somewhat influenced by the glass it's attached to. I believe that it is a little hotter than it registers due to the inside of the house is cooler, which is passed on through the glass. Nice to be able to see the outside temperature from inside. Only problem I had was that the plastic has a little curvature to it, making it a little hard to make it adhere to the outside of the window. But, eventually it stuck. replacement is better than the fisrt one but still not real accurate. It can't be placed in direct sunlight as it will give a very high and inaccurate reading especially in the hot Vegas sun. I have mine on a window under the shade of the patio. Large numbers with red pointer. Easy to read. Needs to be secured with small piece of clear packing tape on top, as vacuum breaks easily and it will fall off. The thermometer is just what I wanted, but will not adhere to my window in the door. I finally punched a hole in the top of it and hung it with a picture or wreath holder. It's to heavy to stay put on its own. I wanted to be able to look out the kitchen window and see the temperature. It would be easy to read if I could get it to stay adhered to the window. I misread the description and invisioned that it would come with something else that would hold it to the window and the actual thermometer would stand away from the window. Any suggestions for making it stick better? the major problem is the difficulty reading the temperature. My thermometer kept falling off of the window until it broke. Very disappointing. Took it out, wiped window off, stuck it on. It fell off before I got inside. I washed the window and stuck it back on. I will have to try to fasten it to the window in some way other than suction or I can't use it. Product would not stick to window . We had to nail it to the exterior of the house, it would not stay stuck to the window at all. I was hoping this temp gage would be accurate, but it only measures the temp of the window. On a 65 degree day with the sun on the window, it measured 100 degrees. Shocked Walter Drake would send such junk out to its customers! Does not measure temperature and will not stick to the window. A few years ago I had purchased a Kleer Temp window thermometer from Walter Drake. It had a thin film with the numbers (temperature) printed on it and was easy to affix to the window and stayed put. This thermometer needed to be replaced so I purchased the present window thermometer which is a much thicker plastic which will not adhere (hold suction) to the window. It was continually falling on the ground. The supplier who makes this item should be taken to task for producing a product which is not serviceable. DOES NOT KEEP THE TEMP RIGHT. ALWAYS WAY OFF. This is an expensive item to have it come out of the package already deteriorating. We remodeled the house adding a big sliding door that we intended to use this thermometer on. We ordered the thermometer in advance of needing it because it might not have been available later. As we took it out of the packaging, most of the black numbers and lines stuck to the clear front packaging. Thank goodness we hadn't put it on our windows earlier to have all that black gunk stuck to our gorgeous new glass! No more imported gadgets for us! Wanted it for our kitchen window. This would absolutely NOT stick on any window or door! Very disappointed with product. Had to remove from window and the black ink used came off and had to be scraped off the window. Useless now since numbers and everything in black is partially gone. RETURNED THE ITEM BECAUSE IT WOULD NOT STICK TO THE WINDOW. WOULD COST TOO MUCH TO RETURN SO I AM STUCK WITH IT. This item does not stick on the window. Does not perform as advertised. Would not recommend it and was a complete waste of my money. This item kept falling off of the glass window I applied it to. The numbers of tempature came off when it fell off the window. It kept accurate tempature but would not stay on the surface applied to. I would like a refund, I threw it away. Total waste of money, doesn't stay put for any period of time. The product came with no directions. Suction doesn't work. Seems to show the correct temperature, but is usually lying on the ground under the window I put it on. Thought this would be great to put on my sliding glass door. Probably would be if it would actually stick to the glass. Stays up maybe an hour before falling off. Actually blew away one night after it had fallen off and I found it in the parking lot well away from my apartment. I couldn't get it to adhere to the window. Have had 2 of these and neither kept the correct temp. When it went down below 0 this winter it showed 30 something. It sometimes is correct in the summer. It is not in the sun at any time (north exposure). Does not work,temperature shows 70 all the time. Very unhappy with product,costs too much to return. No matter what I do. The themrometer will not stay on the window. Don't recommend this product at all. Waster of money. This thermometer worked about a week, then the temperature continally read 72 degrees. Even in the middle of January in New York. I threw it away. Didn't work, was broke when it arrived. Next time I will go to local hardware store. This Thermometer has been up for two day and out of direct sunlight. Today it is registering 110 degrees, when in fact it is 91 degrees. It is not accurate. Disappointing because it looks great. 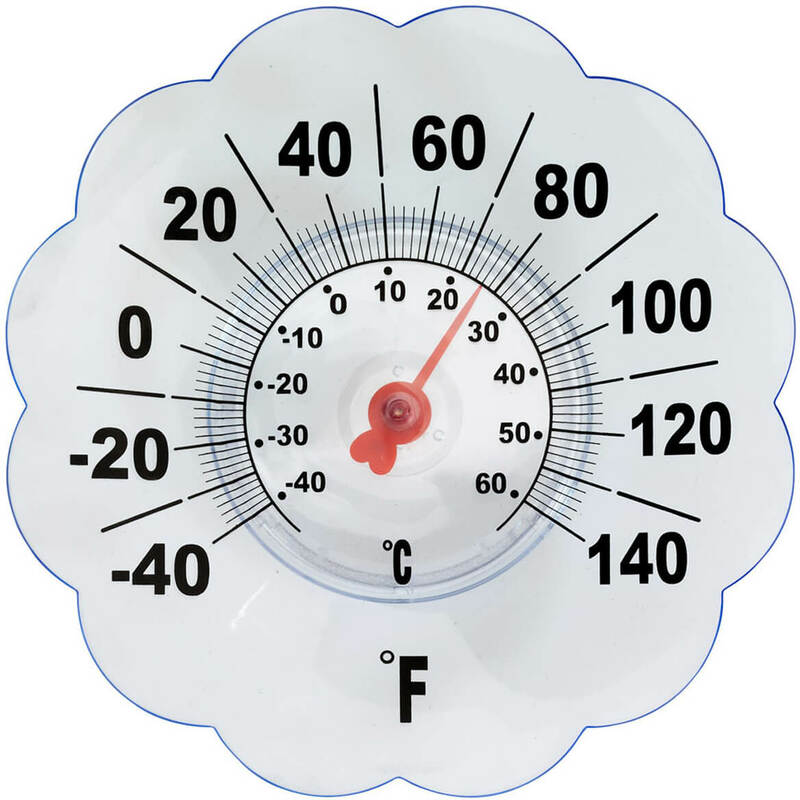 In the catalog photo, you will note the temperature is at about 70 degrees. Ours arrived at 70 degrees and stayed that way regardless of the changes in temperature. It is just plain useless. 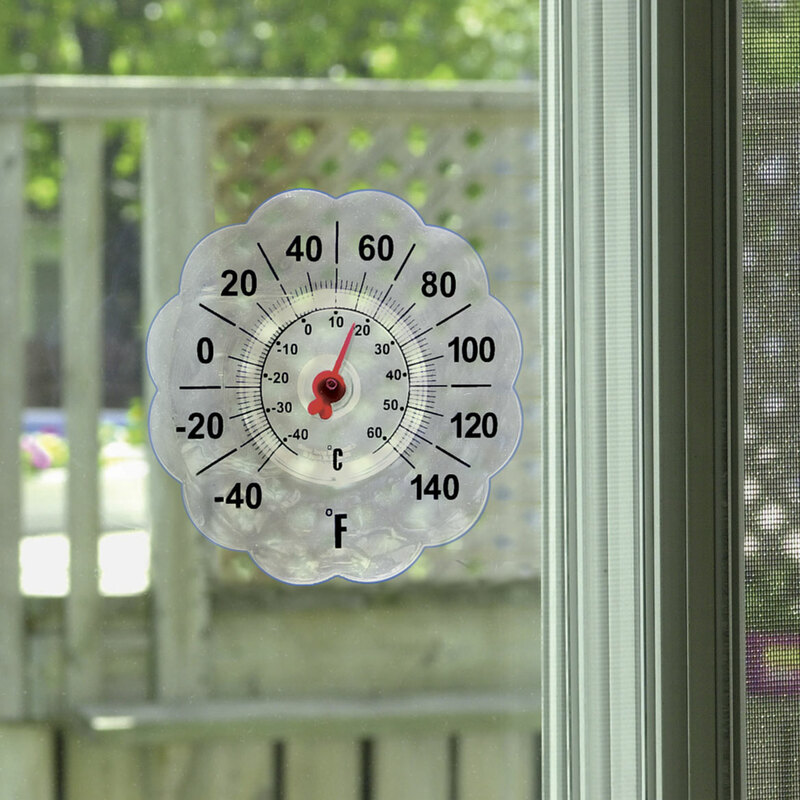 Because the thermometer is flush with the warmer window glass, the temperature shown is not an accurate outdoor temp--it is skewed by the window glass that is warmed by in-house temps. We deserve a refund, but it was too much of a hassle to return in exchange for refund. We wrote it off as a bad purchase. One of the worst pieces of junk I ever bought. Completely useless. The plastic is not pliable. Too stiff to adhere to window. less than one tar, but that is not an option: arrived without directions, was not ut together properly (red needle was not between the two movabel metal pieces, and tho placed in the freezer and the sunshine, the needle NEVER movied. Piece of junk! Great idea, but it doesn't stick to the door glass; keeps falling off. Thermometers will NOT stick to the window Any suggestions ?? The thermometers do not stick to the glass on the window. This worked good in the morning shade, but when the sun hit it, it read over 100 every day - even when it was 80. This did not want to stay on the window, we had to tape it on. I have been trying different window thermometer and they haven't been helpful. I decided to try this item. If successful, I plan to order 1-2 more. We have had a window thermometer for many years and have found it convenient as it is in the window next to the breakfast table and it was accurate. After 10 years it will no longer adhere to the window so we decided it was time to buy a new one. Had one before and works well but just wore out. To be able to look out the window before getting dressed in the mornings, & see the temperature, so I know what to wear for the day. Chosen due to size and would fit between screen/window of apartment. to see the temperature out side . Have had one before; they are GREAT! Best price online, as well. Had this before and liked it. Replace one over 30 years old....!! I like the looks of this thermometer compared to the others I've seen online. Had one earlier. Good product. Clear and large enough to see well even from a distance. It is very accurate. This did stick to the window but did not hold what temp it really is so it is of no use to me. replacement for one I bought several years ago. I have used this item before and it lasted several years! I have moved and decided to get another one. It is easy to read and accurate. I recommend it to anyone who needs an outdoor thermometer they can read from inside. We had one on our RV for years! It worked great. Then we gave one to my parents and finally after about sixteen years the weather wore it out so time for a new one! My mom wanted to be able to see the temp from her kitchen window. hope it sticks to the window better than the static cling type. I CAN HANG IT ON A SHADED WINDOW. EASY TO SEE& READ. I need a small window thermometer. had 1 before & liked it. I have had them before and like them. So that it is easy to see the temperature from the house. I have had them before and still have 2. I bought some like this one in the past and they work so well, so I wanted to purchase more . I really like to know the temperatures and this has BIG numbers. I have had this thermometer for over 8 years until it was accidentally knocked off the window. Had to buy it again - so convenient. I've used this thermometer before - in fact this is my third one. Very satisfied. BEST ANSWER: Thank you for your question. It is not battery operated, the warmth or coldness of the surrounding area will move the arrow up or down as the temperature goes up or down. We hope this information will be of help to you. how do I attach to the window? BEST ANSWER: It sell clings to the window. Clean the surface of the glass and just place it on the window. Works great. We do not place it in the sun as it will give you a higher air temperature. First, dampen the inside of the suction cup then press it to the window. I enforced it by using some clear tape around it to help secure it. You just press it to the outside of the window. The whole thing is a suction cup. My Husband put a little water all around the edges to help it stick to the window.